The EL2088 digital output terminal connects the binary control signals from the automation unit on to the actuators at the process level with electrical isolation. 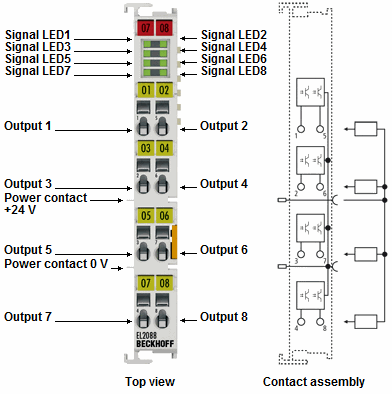 The EtherCAT Terminal has eight 0 V (ground) switching outputs and generates load currents with outputs that are resistant to overload and short-circuit. It contains eight channels that indicate their signal state by means of light emitting diodes.